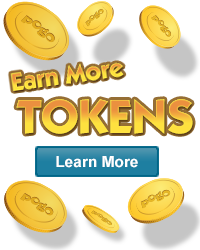 Come back every Sunday for a double scoop of Bonus Tokens and fun chat topics. Use your tokens to send your friend a gift or splurge a little on yourself. This week’s Sunday Token Social is dedicated to April Fool’s Day! Catch the Extreme Fever and enjoy a wild new take on Peggle. It’s win-win in Everyone Wins Bingo, the game where you can’t lose.